The ASSH Executive is delighted to announce the winners of the ASSH Book Prizes for best edited book and best monograph. Play On! is a timely, engaging and well-illustrated account of the development of women’s participation in Australian Rules football across the country. Critically, the book disrupts the Victorian-centric focus that underpins so much of the history of the game; Play On! looks at women’s participation across the country. Adopting a feminist tone, the authors place women, and their highly engaging personal stories, at the centre of discussion. In so doing, Play On! highlights significant gaps in our knowledge. 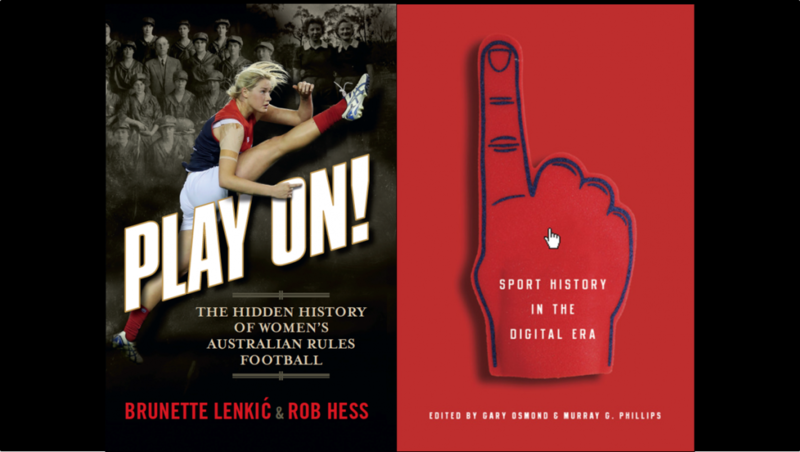 The book draws on a range of primary and secondary sources to present a new interpretation of the early games and teams involving female players. Primary sources include an extensive range of newspapers and in-depth oral interviews. One member of the Awards Committee described Play On! as “the product of a relentless, and possibly comprehensive search, for evidence of any kind of engagement by women in Australian Rules football”. Play On! will appeal to social historians of sport. The chronological approach offers a useful timeline for understanding women’s participation in Australian Rules football. Play On! contextualises shifts and changes in the game by connecting it to identity politics, the media, business, geopolitics and global events such as the world wars and the women’s liberation movement. Cultural historians of sport will appreciate the presentation style of Play On! Rather than a narrative, the authors present a montage of snapshots that, as fragments of the past, draw the reader’s attention to both what is said and what is not said, and what is shown and what is not shown. In this manner, Play On! points to a range of continuities and discontinuities over time. Scholars working in related areas of history, sociology, cultural studies and media studies will certainly find much to interest them in Play On! This important edited collection explores the ways in which digital history is reshaping sports history. The essays are wide-ranging, high-quality, and engage issues of relevance and interest not only to historians of sport but also to scholars in many fields. Although aimed primarily at historians of sport, one of the volume’s several outstanding features is that it will appeal much more widely. The chapter by Martin Johnes and Bob Nicholson, titled “Sport History and Digital Archives in Practice”, for example, is so clear, comprehensive and accessible that it would be an excellent introduction to digital history for scholars in any field. Many of the chapters sparkle. Anybody with doubts about the contemporary relevance of the issues addressed in this volume need only read the riveting—and disturbing—stories that open Mike Cronin’s chapter titled “Social Media as a Research Tool in Sport History”. In an absorbing essay, Holly Thorpe uses internet sources to explore fan reactions to the deaths of American surfer Andy Irons and Canadian freestyle skier Sarah Burke. In so doing, she illustrates the connections between mourning and memory, and digital media and sports history. This is a serious volume; it highlights the calibre of work being undertaken in the field. Dave Nadel & Graeme Ryan (Eds) (2015) Sport in Victoria: A History. Melbourne: Ryan Publishing. Sport in Victoria takes an encyclopaedic approach to its subject with entries on organised and recreational sports, physical activities, organisations, stadiums, clubs, and athletes, players and administrators from the past and present. Like other encyclopaedic volumes of sport, such as the Oxford Companion to Australian Sport, the contributions to Dave and Graeme’s collection reflect on, and synthesise, existing scholarship; and they raise new questions about sporting life in Victoria. Sport in Victoria is well illustrated and makes good use of images, photographs and visual representations. The judging committee is pleased to make this special award. The judges believe that Sport in Victoria is an impressive resource for public libraries, primary and secondary schools, and undergraduate students. Follow the link for a full list of ASSH Book Awards.